A school event, but which one is a mystery. Possibly J. T Rice, Garibaldi or even Sherwood Hall. 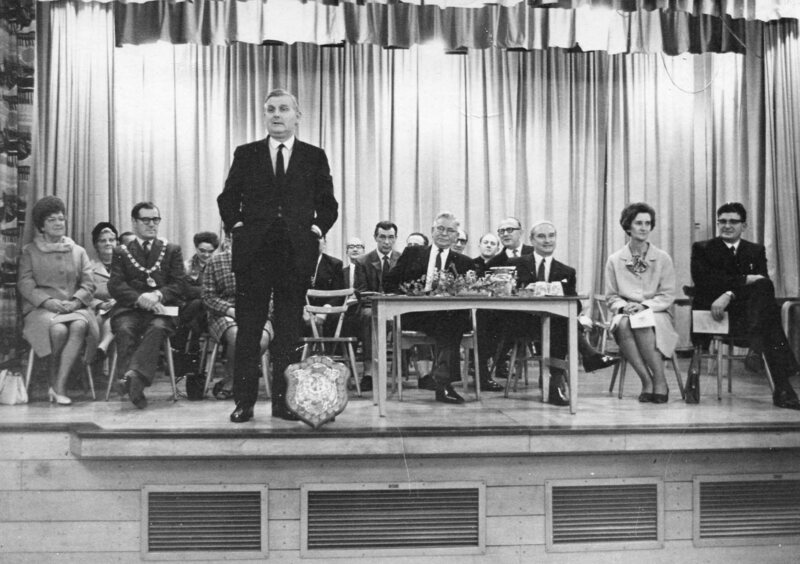 Amongst the dignitaries are Cllr Higginbotham on the left, Cllr D Hudson on the left behind the table and Don Concannon Mansfield MP far right. Not sure that this is Sherwood Hall. The stage looks right but Joe Radford was the Head and from my memory of him he doesn’t appear on the photo. Sherwood Hall opened in 1961. Sorry to disagree with you but I believe this was actually Sherwood Hall opening: I seem to recall a copy of this picture hanging on the wall in the Stuart building hall. Sorry do not know year but I left there in 1964, so would presume it is early 60’s. As Don Concannon sits as though a special guest I’d assume he’s there as MP rather than just a council member so it’s 1966 or later. Do you know what year it was?